The date of this superb work has been determined at around 1884, about the same time as the famous Dance at Bougival (Museum of Fine Arts) was painted. The latter also belonged to François Depeaux before he had to relinquish part of his collection in 1906. This was a period when Renoir, just like Monet, found himself painting still lives ‒ a genre that sold much better than their paintings of more ambitious subjects or their innovating formal studies. 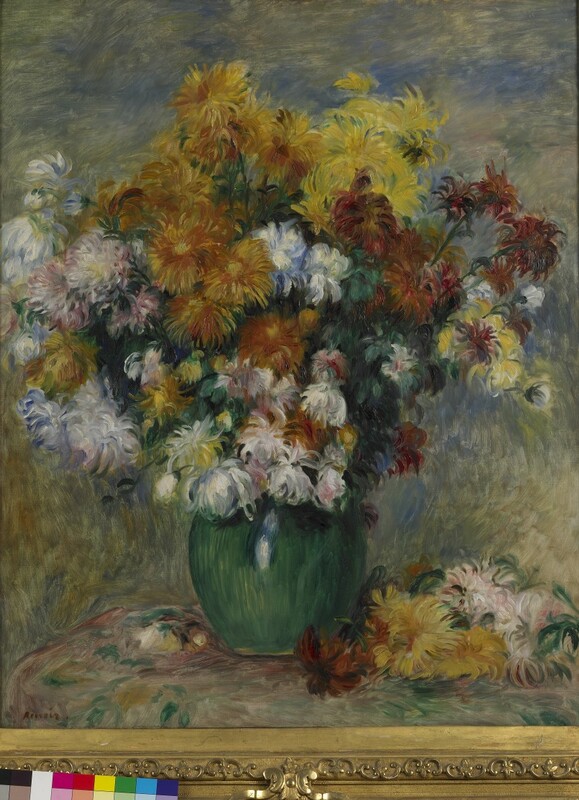 Bouquet of Chrysanthemums differs from Renoir's other flower arrangements in its very simple depiction of a single kind of flower in a plain vase. Unlike so many other still lives, it does not feature a combination of fruit and flowers, nor a painted ceramic vase like those found in the work of artists from Chardin to Fantin-Latour, nor is the floral arrangement set against a complex or multi-layered backdrop, embellished for instance by sumptuous fabrics. Renoir allowed the flowers themselves, through the shape of their petals, to dictate the direction his whirling brushstrokes would take across the canvas; it is the very quality of these brushstrokes that gives the painting its profound sense of unity and its meaning. In this work, modest in its unassuming subject matter but ambitious in its size, Renoir once again toys with our conception of pictorial representation: throughout his career, he delighted in sometimes playing with the differences of stroke in one same painting, while at other times – as is the case here – using even brushwork across the whole canvas to unify the image.